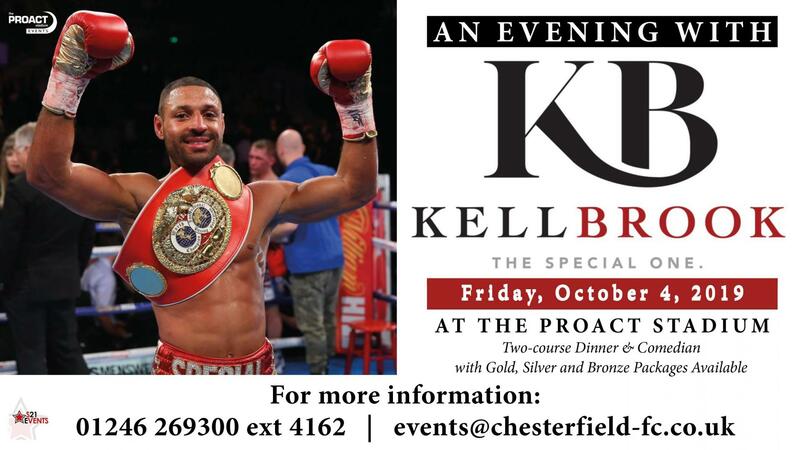 Join us on Friday 4th October for a sporting dinner when boxing superstar Kell Brook will be the special guest here at the Proact Stadium. The former IBF world welterweight champion will take part in a Q&A event in the SBK Computers Spires Restaurant with entertainment provided by a top comedian and a superb two-course meal. One table of ten people. You and your guests will be seated for the evening with Kell Brook and the comedian. Prior to your meal we will host a VIP champagne reception, with a private meet and greet session in our boardroom with Kell Brook and the comedian. 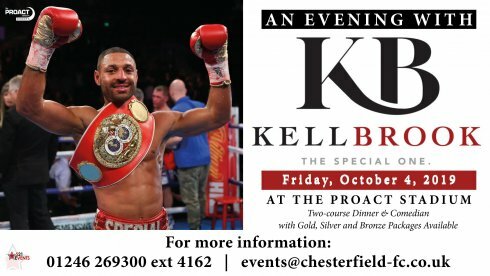 Featuring a VIP drinks reception (bottle of Peroni or a glass of wine) prior to the event and a meet and greet session in the Brampton Brewery 1866 Lounge with Kell Brook and the comedian. Each guest will receive a personalised signed photo with Kell Brook, taken on the night. Each guest will receive a signed autographed photo of Kell Brook. To book, or for further information, please phone 01246 269300 (ext 4162) or email events@chesterfield-fc.co.uk. Demand for tickets is certain to be high, so early booking is strongly advised.